MYPE is a very specialized company devoted to the design, manufacture and installation of electrical and electronic industrial equipments. 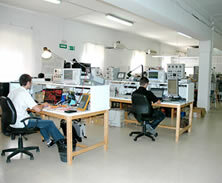 We have our own range of products with all the necessary engineering, in order to meet all costumers’ requirements. Established in 1987, MYPE has a broad experience in multidisciplinary projects, providing optimal integration. Our scope includes electronics, electricity, programming, control, mechanics, hydraulics and pneumatics. This experience allows contributing know-how to the projects. We are capable to participate in the technical specifications draw-up process, for any product or system, providing solutions to improve performances and reduce costs. We specialize in high-performance business environments such as the railway sector, carrying out projects and supplying custom-made products, with high-efficiency and short-term delivery. Our projects are always in compliance with current norms and EC standards, as we have our own testing and verification facilities and an experienced quality management.